Hundreds of sites and structures established for the defence of Scotland in the First World War are explored in an extensive audit of the conflict’s built heritage, published today (9th February). It reveals previously unknown details of many aspects of our wartime heritage, including top secret anti-invasion defences prepared around Edinburgh in case of enemy attack. The audit, commissioned by Historic Scotland and the Royal Commission on the Ancient and Historical Monuments of Scotland (RCAHMS), has unearthed an enormous amount of new information which has allowed the records of 900 buildings and places to be created or updated, more than triple the number expected at the outset. As Scotland prepares to commemorate the centenary of WW1, the audit of wartime assets has provided a fuller picture of the built heritage that can teach us about the country’s part in the war at a local and national level. One key finding on previously unknown War Office maps is the extent of the land-based anti-invasion defences that were put in place around Edinburgh and across the Lothians and Fife in order to stop an enemy attack. A detailed study of high definition aerial photography has revealed surviving elements of the network of trenches and earthworks dating back to WW1. The most extensive defences were located to the east of Edinburgh at Portobello and stretched from the shore of the River Forth to the south of the city. This defensive system, of barbed wire, firing trenches and strongpoints, was critical to ensuring the city was defended from a land attack. 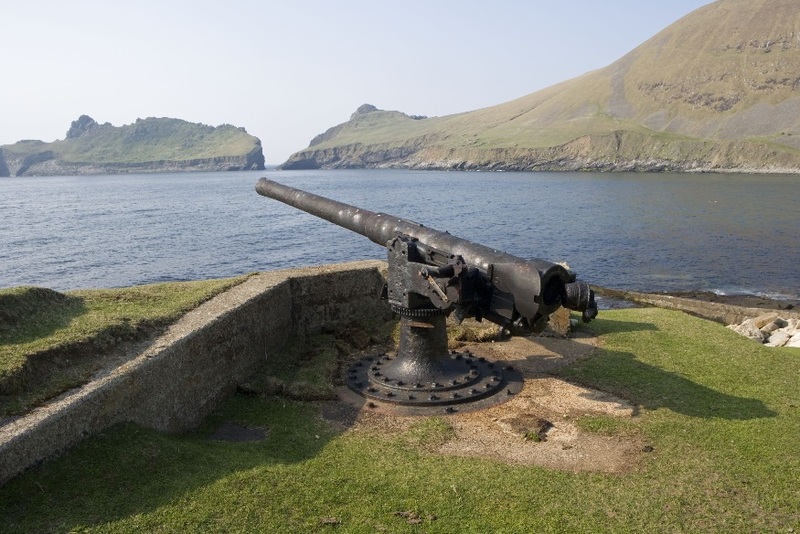 St Kilda – Gun emplacement overlooking village bay on St Kilda © Crown Copyright: RCAHMS. The audit has shown that of 350 drill halls that were in use in Scotland during WW1, 189 survive today. These places were the training bases for volunteer soldiers. While the role of these buildings was similar, the varying architectural styles of the buildings is fascinating – from quite grand structures to much simpler and functional designs. Some of these wartime heritage assets will be designated by Historic Scotland during the centenary period, to recognise and protect their significance for future generations. Fiona Hyslop, Cabinet Secretary for Culture and External Affairs, welcomed the audit’s findings. She said: “Our World War One built heritage is a vital part of our historic environment and is key to educating us about Scotland’s role in the conflict. This audit will prove invaluable to our understanding of how every community played its part during the First World War. The Built Heritage of the First World War in Scotland audit is now available for everyone to use and can be viewed here. Header Image : Inchinnan – Inchinnan airship shed in 1916. It was constructed by Sir William Arrol © RCAHMS (Sir William Arrol Collection).